Thousands of people on Saturday staged demonstration across the country demanding arrest and exemplary punishment to the killers of Feni Madrasa student Nusrat Jahan Rafi. Different political, socio-cultural, rights and students' organisations staged demonstrations and formed separate human chains in Dhaka and other parts of the country. Communist Party of Bangladesh (CPB) formed a one hour human chain from Bangabhaban to Ganabhaban on Saturday. CPB President Mujahidul Islam Selim called on the government to ensure equal rights for men and women according to the spirit of Bangladesh's War for Independence in 1971. He urged the political parties and socio-cultural organisations to observe women and children rights protection week form April 20 to 27 across the country. Taking part in the human chain at Motijheel Selim said that they would continue the demonstrations until the accused of the Nusrat murder get exemplary punishments. He also demanded punishment to the killers of Sagar-Runi, Tauki, Tanu, and Afsana immediately. Human rights activist Sultana Kamal demanded capital punishment to those people who were involved in Nusrat murder. "The government should arrest the rest of killers and punish them as early as possible. It also must ensure security for all especially for the women all over the country. Nusrat's killing is just brutality. We do not want repetition of such kind of incident in our country," she said after taking part in a human chain in the capital's Dhanmondi area under the banner of Green Voice on Saturday. Leaders and activists of the Bangladesh Trade Union Centre, Garment Workers' Trade Union Centre, Bangladesh Hawkers' Union, Krishok Samiti, Khetmajur Samiti, Chhatra Union, Udichi Shilpi Gosthi, Women Cell of CPB, Juba Union, Jatiya Mukti Council and others socio cultural organisations formed human chain in front of National Press Club, Shahbagh, Kalabagan and Asad Gate area. Workers Party of Bangladesh President Rashed Khan Menon also called on political parties and socio cultural organisations to be united to resist the repressions on women and children. Oikya NAP and Sammilita Samajik Andolan held separate protest rallies in front of the National Museum, at Shahbagh demanding justice for the Nusrat killing. 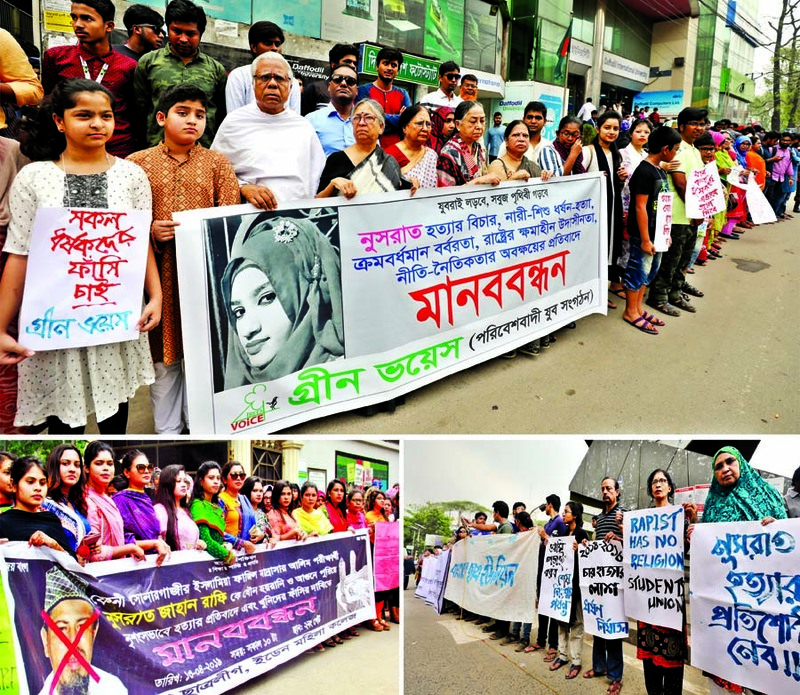 Bangladesh Cholochitro Parished formed a human chain demandingÂ justice for Nusrat in front of the Bangladesh Film Development Corporation. About one hundred actors, directors and other officials of the film industry took part in the human chain. Meanwhile, a good number of educational institutions and socio-cultural organizations held human chains in most of the districts. Everywhere, people agreed on the common demand -highest punishment to be incorporated in the law for the people responsible for Nusrat's death. The protesters urged the government to ensure safety and security for women in all educational institutions and offices, on roads and in public spaces as per the 2009 High Court directives and to form anti-sexual harassment committees in all educational institutions.